Your best friend, always happy to see you, loves to snuggle… sometimes it really feels like pets are better than other people. This Valentine’s Day don’t forget to give them a little extra TLC but while you’re at it, keep them safe too. 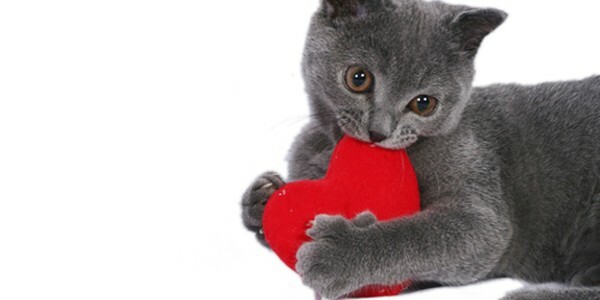 Keep the candy away – Boxed chocolate in a red heart shaped box, candy shaped hearts with little messages on them, lollipops shaped as a big red heart all contain sugar and other ingredients that are toxic to your pet. Keep the sweets away from your pet. Flowers – Did you get roses? Did you get a dozen? That’s great but your pet might want to inspect them. Don’t let your dog or cat nibble them. Eating roses can cause an upset stomach, vomiting, and other problems. Wrapping paper and ribbons – Gifts are awesome surprises. Make sure to throw away the pretty ribbons, bows, and paper. While shredding wrapping paper won’t harm your pet, if your cat swallows ribbon it could get caught in the intestines and cause major problems. Blow out the candles – Having a romantic night at home? Before turning in for the night, blow out all the candles. Your pet could knock it over by accident and hurt themselves with hot wax or burn something in the house. Put away the alcohol – Never leave out any half glasses of wine or champagne. Your curious pet might lick or ingest some of it. Alcohol can cause vomiting, diarrhea, and harm their metabolism. Pour out any drinks not finished, put the bottles away, and keep the recycling out of reach from your pet. Is Your Cat Peeing On The Bed?